Information for new investors on selecting stocks, managing risk and managing one’s contest portfolio. To understand human beings, one must concentrate on their behavior rather than their words. The same goes for the markets. Ignore all of the verbal noise of the media pundits and concentrate on the markets’ actions. And this market appears to be turning around, at least for now. The T2108 is well out of oversold territory and the indexes are crossing above both their long and short term moving averages. All but two of the market leaders I follow are showing signs of strength, including AZO, AMZN, AAPL, GOOG, FFIV, CMG and BIDU. NFLX has been in a down-trend since July and PCLN is flat. The fact that a leader like AAPL can come through the volatility of the past few months within 1% of its all-time high bodes well for tech and growth stocks. I am wading into this market and have a position in AAPL. The other indicator that is encouraging me to go long is the fact that the Investors Intelligence poll of investment advisers shows about 5% more bears than bulls. This rarely happens and the market often goes up when so many professionals have given up on the market. Yes, we still have to get through that dreaded month of October, but remember that the “sell in May and go away” mantra says to go back into the market around Halloween. I have seen many markets bottom out in October. When there are only a few stocks hitting 52 week highs, it is easy to go through the list of new highs to look for stocks that may surge higher when the market strengthens. On September 7, I wrote about the technical strength in AZO at $313.83. AZO closed on Friday at $331.25 up 5.5%, but more importantly a rise of over $17. I buy expensive stocks and trade on the point move, not the percentage move, and a 17 point move on one call option = $1700. The following stocks showed up on the new high list on Friday, have strong recent quarterly earnings and look technically promising to me: JAZZ, ATHN, DLLR, EVEP, HITK. I will place these on my watch list for potential buys if the market trend continues up. 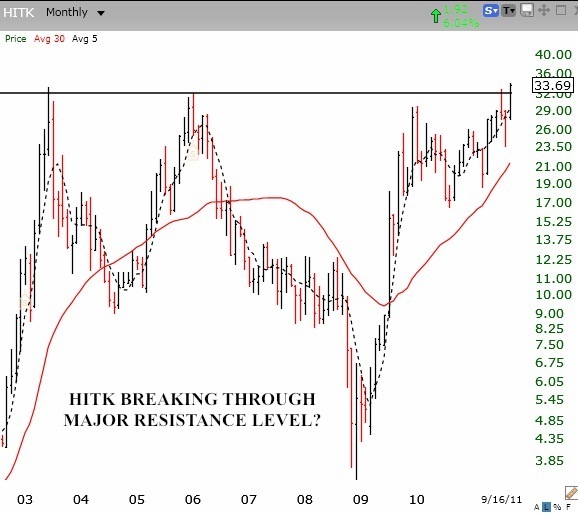 As this monthly chart shows, HITK has just broken through a major resistance level over the past 8 years. Institutions may have stepped up buying of HITK. HITK has a 98 (out of 100) composite rating in IBD and is at or near the top in each IBD group comparison. 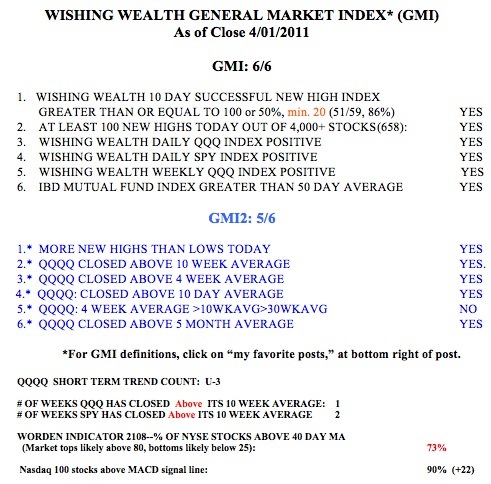 The GMI and GMI-2 are each at 3 (of 6). 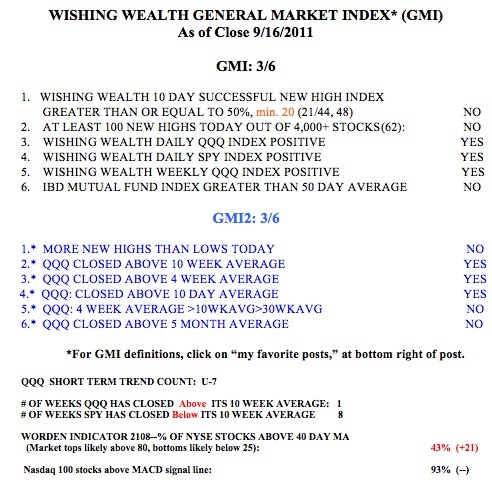 The last time the GMI was at 3 was August 1. All of my indicators that reflect the indexes’ place in relation to their moving averages are positive. The remaining negative indicators in the GMI will depend on their being a longer up-trend that will show more new highs that continue to move up, and on the performance of the IBD Mutual Fund Index. If you have a subscription to IBD, take a look at the insightful interview with William O’Neil, the founder of IBD and creator of the CAN SLIM method, posted on Monday’s homepage of the IBD site. He discusses a number of the stocks I have highlighted recently, including AAPL, ALXN and ATHN. Note that the QQQ is now above its 10 week average and leading the market up, while the SPY, which includes financial stocks, is still bearly (pun intended) below its 10 week average, for the 8th week. I generally can make money trading tech stocks when the QQQ remains above its 10 week average. I am still concerned that its 30 week average (red solid line) is declining, but at least the index is now above that critical average. So, I am buying some growth stocks in my speculative accounts. I am considering slowly wading back into the growth mutual fund in stages in my university pension this week, but I prefer the 10 week average (blue dotted line) to be rising. See the pattern at the rise that began in September, 2010. Click on chart to enlarge. Note that the registration for the Fall 2010 Stock Challenge begins today and is open to honors alumni and all students faculty and staff in the University of Maryland System. 7th day of new QQQ short term up-trend; Sell in May and go away? While almost all of my indicators are positive, I am keeping an eye on AAPL, which is still weak. The popular explanation for AAPL’s weakness is that its weighting in the Nasdaq 100 index will be reduced on May 2. 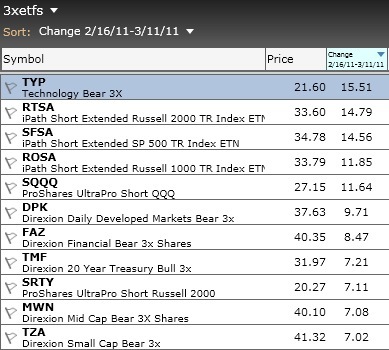 ETF’s that mimic this index will have to reduce their holdings in AAPL. I am not so sure that is the only reason behind AAPL’s weakness. This leading stock may just have been pushed to the limit for this market cycle? As we get closer to May, I always remember the analyses that show that one should “Sell in May and go away.” With the percentage of bearish advisers taking a sudden dip to 15.7%, this party may be getting late. If the percentage of bullish advisers should climb above 60% (it is now 57.3%) I will become very concerned. Sentiment is a contrary indicator, most people are bullish near market tops. In January, IBD discontinued the IBD100 list of stocks published each Monday and started publishing a shorter, better list of 50 stocks—IBD50. I rely heavily on IBD’s list of stocks because I am convinced that the high momentum growth stocks that meet their selection criteria do out-perform other stocks in a rising market. I have shown that in a declining market they do much worse. Hence the “M” in William O’Neil’s (IBD’s publisher and owner) CAN SLIM approach to trading stocks. The “M” signifies that one must trade consistent with the overall market’s trend. I build watch lists in TC2000 periodically for the IBD100/IBD50 list published in Monday’s edition of IBD. While I recommend that people get a subscription to IBD so they can use their excellent website, some people may benefit from getting at least the Monday edition at the local newsstand. 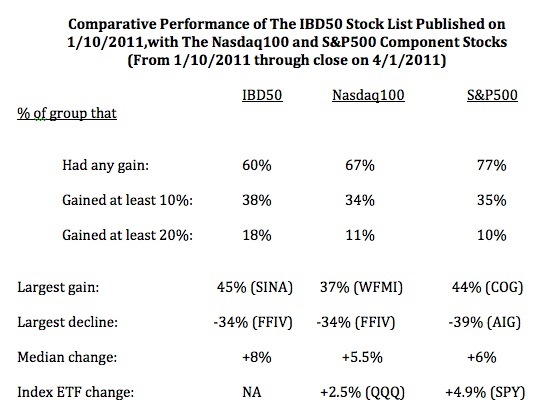 The first IBD50 list I stored was the one published on Monday, January 10, 2011. Over the weekend I computed performance statistics for the 50 stocks on the list since their close the Friday before publication through last Friday’s close. I compared the IBD50 stock performance to the stocks in the Nasdaq100 and S&P500 indexes. This table shows a few interesting things. During this time period, the Nasdaq100 index ETF (QQQ) advanced +2.5% and the S&P500 ETF (SPY) rose +4.9%. So this is a period when the nonfinancial tech stocks that make up the Nasdaq100 index and are most similar to the IBD50 type of stocks, underperformed the S&P500 type of large cap, stocks. Thus, the results for the IBD50 are probably poorer in this period than in periods when tech stocks are outperforming. Nevertheless, the table tells an interesting story. Click on table to enlarge. A higher percentage of the Nasdaq100 and S&P500 component stocks rose (67% and 77%, respectively) than the IBD50 stocks (60%). However, more IBD50 stocks gained at least 10% or 20%. In fact, the IBD50 stocks were much more likely to gain 20% in this period, 18% rose 20%+, compared to 11% of the Nasdaq100 stocks and 10% of the S&P500 stocks. The IBD50 stock list also contained a stock that gained the most, SINA (+45%), while the largest gainer in the Nasdaq100 stocks was WFMI (+37%) and in the S&P500 stocks, COG (+44%). The biggest loser in each of the 3 lists (FFIV and AIG) was down -34% to -39%. The median change (one half of the stocks did better than this value) for the IBD50 was +8%, larger than the median change in the other two lists (+5.5% and +6%), showing that the IBD50 stocks did outperform the other two lists of stocks. My conclusion from this analysis is that in a period when tech stocks underperformed the general market, the IBD50 stocks did somewhat better. Most important the IBD50 list was a better place for finding large gainers. And to find the 20%+ gainers one only had to research 50 stocks instead of the 100 or 500 stocks in these other two indexes. Maybe IBD has a good idea here…..
Friday was the 3rd day (U-3) in the new QQQ short term up-trend. When it gets to 5 days, I will be more confident of its longevity. But keep in mind that the QQQQ and other major stock market indexes remain in longer term up-trends. Thus, I have not touched my long term university pension mutual funds. I only transfer them to money market funds when the major trends turn down. The GMI is at a very comfortable 6. The GMI2 is at only 5, because the pattern 4wk moving average > 10 wk > 30 wk is not present. The 4wk average remains below the 10 wk average. Both the QQQ and SPY are now above their 10 week averages, a promising sign. And 90% of the Nasdaq 100 stocks closed with their daily MACD above its signal line, a sign of strength. One note of caution is that the Worden T2108 indicator is at 73%, near the overbought levels where markets can top out. I will be concerned if the T2108 breaks 80%. With the start of the short term up-trend I am starting to look for stocks to buy. I used TC2000 to scan all of the IBD50 stocks that I entered into watch lists this year. I looked for stocks bouncing up off of their 10 week moving average. Many growth stocks, once launched, track their rising 10 week averages for months. I often buy such stocks after they bounce off of this average and place a sell stop slightly below the low of the week in which they bounced. All of the IBD50 stocks in this table showed up in my scan as having bounced their 10 week average last week. The second column shows the lowest price at which each stock traded last week and the point where I am looking to place a sell stop if I were to purchase one of these stocks. This would be a good list of possible buy candidates for my students and others participating in our simulated university stock challenge, UMDSMC, to research. I never fight the trend of the general market. 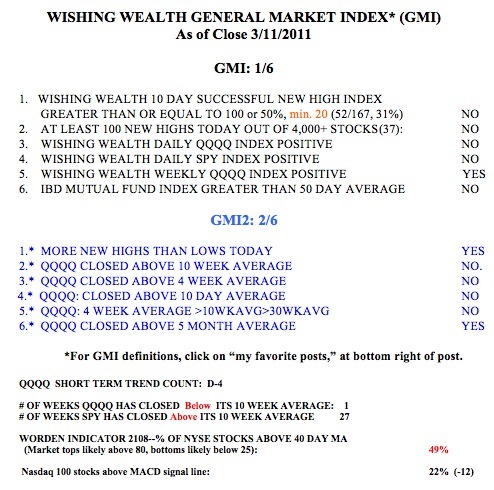 With the GMI registering 1, and the QQQQ short term down-trend having reached its 5th day, I am confident that the best place to be in my short term trading account is on the sidelines or short. So, I remain in cash and hold a small position in QID. The market peaked on February 16, weeks before the earthquake in Japan. The events in Japan have merely enhanced the speed and the depth of the decline. I have been writing about a possible change in trend since the up-trend ended on February 22, after its 64th day, and IBD has called this market in a correction for days. The pre-market futures suggest we will get a large decline on Tuesday, at least at the open. It is so much easier to profit from owning stocks during an up-trend, why stay long during a down-trend? It took me many years to learn this valuable lesson. The longer term market trends remain up, for now. But remember, every long term down-trend begins with a short term down-trend. The key to profiting in the stock market is to be in long positions during up-trends and on the sidelines or short during down-trends. Because the longer term trend of the market remains up, I keep my university pension funds invested in mutual funds. However, in my shorter term trading accounts, I refuse to stay in the market during times like these. The GMI is registering 1 (of 6) and the new GMI2 is 2 (of 6). With most of my market indicators negative, the odds are against my making money on the long side. One more day of the down-trend, will provide more evidence of the staying power of the down-trend. Once a down-trend extends for 5 days, it often continues (see below). The QQQQ (Nasdaq100 index ETF) closed below its 10 week average on Friday, after staying above it for 26 straight weeks. This is a significant breakdown in the up-trend that began in September. The SPY (S&P500 Index ETF) is sitting right on its 10 week average and therefore reached week 27 above its 10 week average. 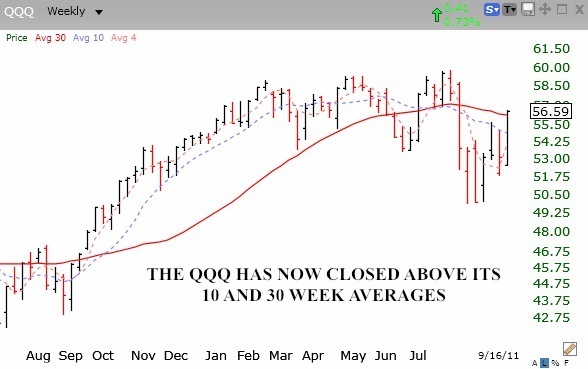 I have found that when the QQQQ closes below its 10 week average, I am unlikely to make money buying tech stocks. It does not mean that the market will enter a long down-trend, only that the odds have shifted against going long. Similarly, the IBD Mutual Fund Index is now below its 50 day average for the first time since this rally began in September. When these growth mutual funds do not do well, neither will I. That is why this index is one of the components in the GMI. Only 22% of the Nasdaq 100 stocks closed with their MACD above its signal line, another sign of short term weakness. 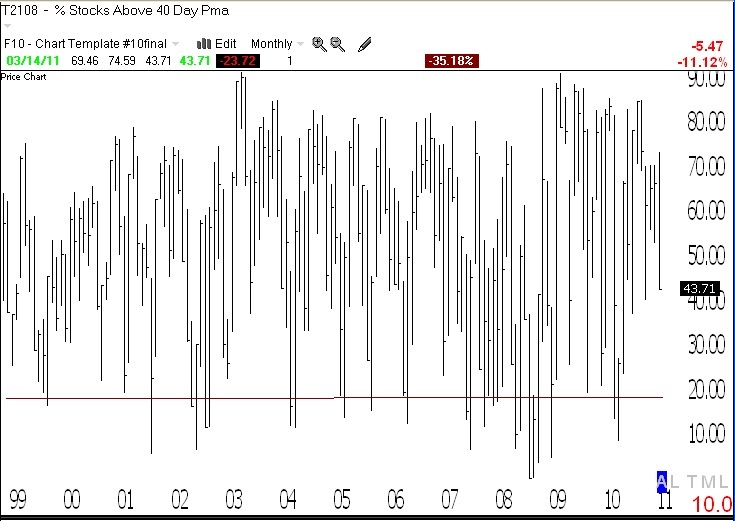 And the Worden T2108 Indicator is 49%, in neutral territory. I look for the T2108 to fall below 20 to signal that a market decline may be near an important bottom. So, if this is not the time to be long, what can one do, other than to sit in cash? The answer is to short individual stocks in a margin account, buy put options , or buy inverse index ETF’s that rise when the market declines. I have been writing about inverse ETF’s lately. My favorite is QID, which aims to rise 2x as much as the QQQQ declines. But there are a number of other ultra inverse ETF’s to buy to bet on a market decline. I ranked all of the 3X ETF’s in a watchlist I created using the new TC2000 software, according to how well they performed in the period from the recent peak of the QQQQ on 2/16 through Friday’s close on 3/11, a time during which the QQQQ declined -4.06%. The top 10 gainers during this period of a declining market rose between +15.5% to 7.02%! (Click on table to enlarge.) So this is how one might profit from a declining market. However, please note that one must quickly exit from one of these ultra inverse ETF’s when the down-trend ends. What goes up 3X as fast declines 3X as fast. For those students participating in the virtual trading contest (UMDSMC), you might want to buy some of these ultra inverse ETF’s in stages, only adding to your position if the decline in the market continues. Working backward from the current 4 day decline, the length of recent declines, according to the way I define them, has been: 2,3,2,16,4,12,29 and 19 days, respectively. Note that none of the declines that reached 5 days lasted fewer than 12 days…..